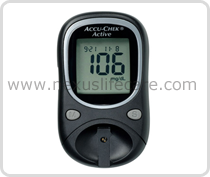 Product Description:- The Accu-Chek Active system now offers functions to mark and evaluate the pre- and post-meal blood glucose values; the latter have moved into the focus of attention as a major independent cardiovascular risk factor over the past years. The new Accu-Chek Active system provides the option to flag these values of particular importance and thus supports a precise evaluation of the metabolic situation. Furthermore, the averages of pre- and post-meal values for the last 7, 14 or 30 days can be retrieved from the meter's memory and displayed directly on its screen. Accu-Chek Active has a 350-value memory for saving results (together with date and times) as well as an infrared interface for communicating with a PC running a suitable analysis program. No need to press buttons when you carry out the test. Application of blood to the test strip starts a colour reaction. The final colour is accurately read (measured photo metrically) by the monitor's optical system and the result is converted to a blood glucose value.